Inferring, questioning, determining importance. It's not easy to teach these abstract thinking strategies, yet research tells us that by teaching kids to think, we are offering them access to the world. Fortunately, Tanny McGregor has developed visual, tangible, everyday lessons that make abstract thinking concrete. 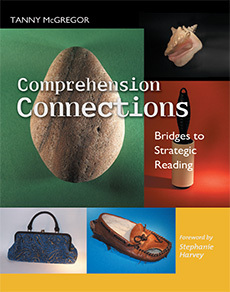 Tanny's bestselling book, Comprehension Connections: Bridges to Strategic Reading, is a guide to developing children's ability to fully understand texts by making the thinking process achievable, accessible, and incremental. In this seminar, participants will learn how to sequence their teaching to take students from a fun object lesson to a nuanced and lasting understanding of text. Art, music, and movement are incorporated into a supportive structure that reinforces the thinking strategies on a variety of levels. Teachers will learn to launch units and create lessons that provide for explicit teaching and value student thinking. Comprehension Connections will be used as a practical resource to support best practice across the school day. To align current research with everyday instruction, building bridges between the concrete and abstract.